On Aug. 29, the University of Florida was honored with the Energy Efficiency Leader Award from Trane in recognition of the school’s commitment to providing a healthy, productive learning environment with minimal impact on the environment. Shown here (from left) are University leaders, including Curtis Reynolds, vice president for Business Affairs and Eddie Daniels, assistant vice president for Business Services and Trane leaders, Felix Wilson, vice president, Commercial HVAC NA & EMEA, and Steve Corson, Complex Systems account manager. 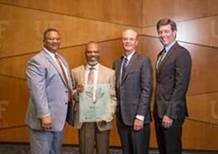 The University of Florida received the Energy Efficiency Leader Award from Trane on Aug 29. The award recognizes the university’s commitment to sustainability including recent energy efficient upgrades to the J. Wayne Reitz Union, shown here, which are saving more than $550,000 a year in energy costs. 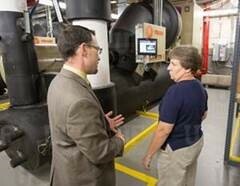 Chad Doering, director of Housing for Facilities Management, Division of Housing & Residence Education, at the University of Florida and Sheila Noel, Reitz Union maintenance specialist at the university, discuss the union’s upgraded chilled water system designed to lower environmental impact. This system is one component of the long-term commitment to sustainability for which the university was recognized with the Trane Energy Efficiency Leader Award on Aug. 29. GAINESVILLE, Fla., August 31, 2017 /3BL Media/ - Trane®, a leading global provider of indoor comfort systems and services and a brand of Ingersoll Rand, presented its annual Energy Efficiency Leader Award on Aug. 29 to the University of Florida. The award recognizes the university’s commitment to providing a healthy, productive learning environment with minimal impact on the environment. This commitment includes an energy-efficient approach to the renovation of the university’s J. Wayne Reitz Union building, an upgrade project that continues to exceed performance expectations. Actual energy savings have surpassed 53 percent since infrastructure upgrades were implemented. The upgrades are saving more than $550,000 a year, which represents more than 150 percent of anticipated savings. Each year, Ingersoll Rand and its brands recognize organizations which demonstrate an outstanding commitment to implementing best practices in energy efficiency and sustainability. Trane has selected the University of Florida as one of just three organizations to receive the award in 2017. At the award ceremony, held earlier this week at the J. Wayne Reitz Union building, Felix Wilson, vice president, Commercial HVAC NA & EMEA, at Trane, presented the award to university leaders, including Eddie Daniels and Curtis Reynolds, vice president for Business Affairs. Given tight budgets, it can be challenging for colleges and universities to fund renovation and infrastructure upgrades needed to provide a more sustainable environment. According to the Wall Street Journal®, a recent report by Sightlines®, a facilities advisory firm, found that the deferred maintenance backlog at colleges nationwide topped $100 per gross square foot of space in 2015, up from $81.72 in 2007. For the University of Florida, funding the infrastructure improvements with a performance contract enabled the school to pay for the upgrades through future energy savings rather than additional capital expenditures. Prior to implementing the upgrades, university leaders completed an audit of the building to identify opportunities for improvements. Based on the results, University of Florida leaders maximized energy conservation measures for the facility. Improvements included an upgraded chilled water system designed to lower environmental impact. The project team also added a building automaton system to control HVAC and lighting systems throughout the building and to use for scheduling occupied/unoccupied control for night setback of cooling and heating set points. The union upgrade project also received the 2016 EBie® Power to the People Award for the greatest percentage reduction in building energy use from the Urban Green Council in New York. Trane and Circle Logo are trademarks of Trane in the United States and other countries. EBie is a registered trademark of New York Chapter, U.S. Green Building Counsel, Inc. The Wall Street Journal is a registered trademark of Dow Jones, L.P. Sightlines is a registered trademark of Sightlines, LLC. All trademarks referenced are the trademarks of their respective owners. Ingersoll Rand (NYSE:IR) advances the quality of life by creating comfortable, sustainable and efficient environments. Our people and our family of brands—including Club Car®, Ingersoll Rand®, Thermo King® and Trane®—work together to enhance the quality and comfort of air in homes and buildings; transport and protect food and perishables; and increase industrial productivity and efficiency. We are a $13 billion global business committed to a world of sustainable progress and enduring results. Trane solutions optimize indoor environments with a broad portfolio of energy efficient heating, ventilating and air conditioning systems, building and contracting services, parts support and advanced control. For more information, visit www.ingersollrand.com or www.trane.com. The University of Florida’s mission is to prepare our students to lead and influence the next generation and beyond for economic, cultural and societal benefit. One of the nation’s largest public universities, UF is the only member of the Association of American Universities in the state of Florida. Teaching, research and scholarship, and service span all of the UF’s academic disciplines and represent its commitment to be a premier university that the state, nation and world look to for leadership. www.ufl.edu.